​​​​​​​​ SAN ANTONIO – Work has begun on the $70.2 million, 108,000-sf building on Floyd Curl Dr. that will serve as the new home for the Sam & Ann Barshop Institute for Longevity & Aging Studies. The new structure will house research labs, laboratory support, research faculty, administrative offices and other support spaces. The plan also calls for a pedestrian bridge to connect the Barshop Institute with the South Texas Research Facility. 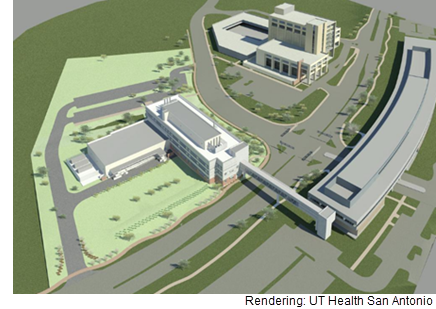 UT Health San Antonio is developing the new multi-story structure in the South Texas Medical Center to consolidate research activities. Currently, the institute has about 200 faculty investigators working across several buildings and departments within the UT Health San Antonio system.